“The hurdles which must be overcome in order to obtain a compulsory licence vary considerably amongst the jurisdictions covered in this text. For example, in order to obtain a non-use compulsory licence in Australia, China, France, Germany, India, and Japan one must wait three years after the patent has been granted and establish that the reasonable rights of the public have not been met. There are various other requirements such as, for example, that one may have to attempt to obtain a licence directly for a reasonable period and demonstrate that the patentee has not satisfactorily explained the reason for failing to exploit. However, in Canada one has to prove that the patentee has abused the patent monopoly in order to obtain a compulsory licence and a similar compulsory licence exists in the United Kingdom. There are no provisions for the grant of compulsory licences in the United States apart from those governed by the Bayh-Dole regime. As before, this is a short excerpt from one of the overview summary sections. 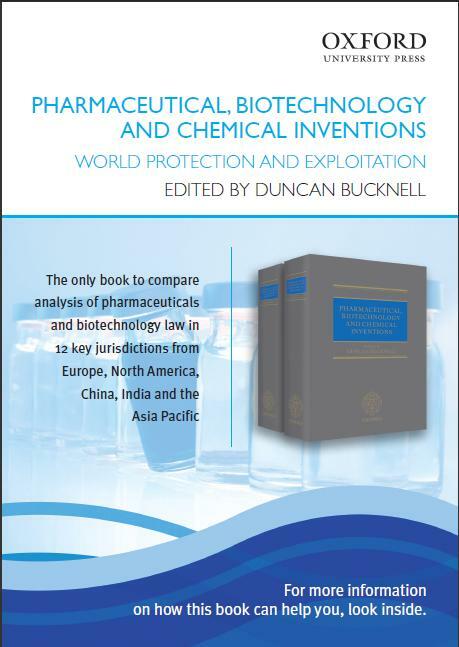 Just to recap, it’s a detailed and strategic look at intellectual property and related issues in the pharmaceutical, biotechnology and chemical industries. It covers 11 jurisdictions, has a Europe overview section and will be published by Oxford University Press. It is topic based, so that you can see how the same issue is dealt with across the globe in one spot. Just to give you a little more background, the book will be published in a 2 volume set, with about 1,800 pages. It’s designed for the in-house team – to make things way easier than they are today.